On the evening of February 1st, 2017, we will convene the Gravois-Jefferson Historic Neighborhoods Steering Committee for the group’s third meeting. We will be discussing community input, canvassing techniques, neighborhood history, and the upcoming working meeting. On the morning of February 9th, 2017, we will be convening a group of local and regional stakeholders committed to youth participation and empowerment. 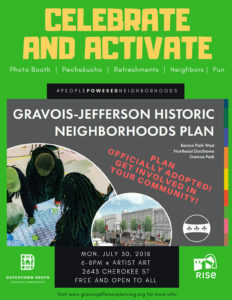 We will be introducing the Gravois-Jefferson planning process, the community input we have received related to youth (strengths and challenges, as well as goals and strategies), and seeking their guidance throughout our process and into implementation. The partners participating were suggested by residents during out first working meeting and other community engagement. City of St. Louis Planning Commission Meeting where the adoption of the Gravois-Jefferson Historic Neighborhoods Plan will be on the agenda. Celebrate the plan adoption and learn what's next with your neighbors. This event is hosted by Dutchtown South Community Corporation with support from Rise Community Development. Featured will be pechakucha presentations, refreshments, a photo booth, and fun with your neighbors. This free and open to all event will be a combination between a celebration of the work already done and planning for the hard work that comes next. Come out and join us! View this event on Facebook here.